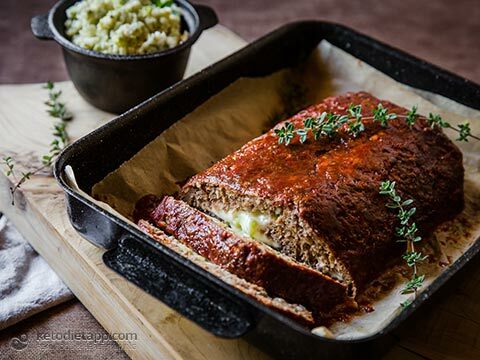 This meatloaf brings my childhood flooding back with each bite. 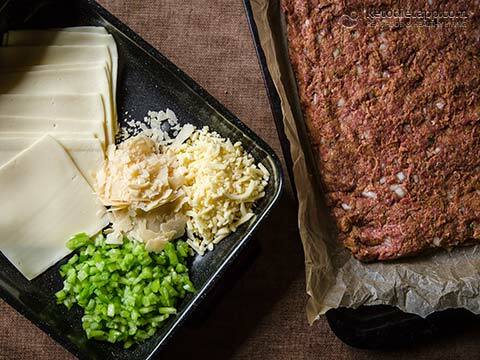 My Dad used to make it for us and I can recall thinking that it was incredibly fancy to have all that gooey melted cheese hidden inside a lush meatloaf. Yep, I was pretty easily impressed. Come to think of it, I’m still impressed if you give me melted cheese. 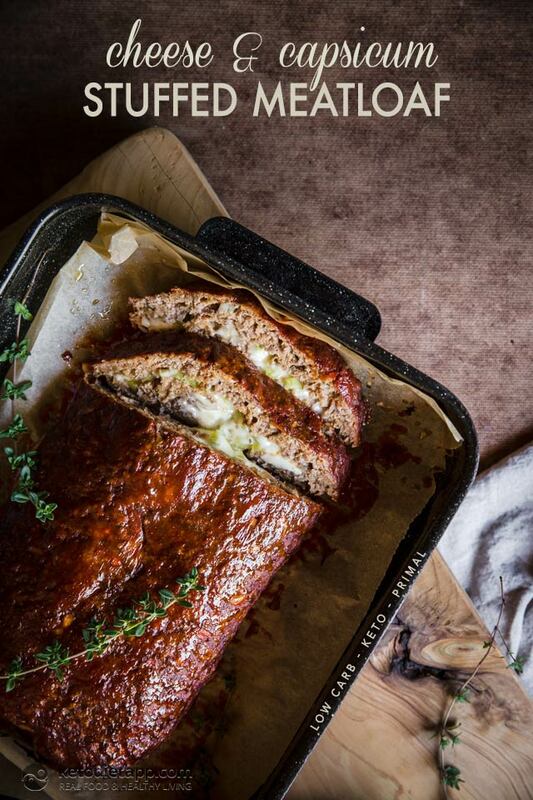 I had to make a couple of tweaks to make it low carb, but nothing that changed the core flavour of this meatloaf. 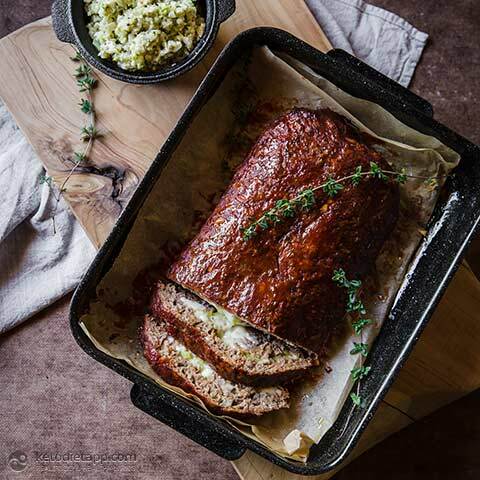 I love to serve it with cauliflower rice or mashed cauliflower. Try it, give my Dad a big clap. Enjoy! Pre-heat oven to 180 °C/ 355 °F. 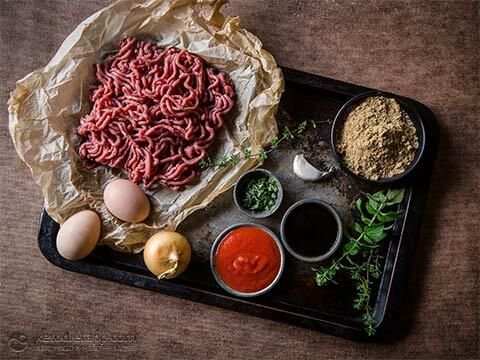 Place the ground beef, onion, garlic, eggs, flaxmeal, 2 tbsp of coconut aminos, 4 tbsp of passata and herbs in a large bowl and combine well by hand. Line a baking tray with silicone paper and set to one side. 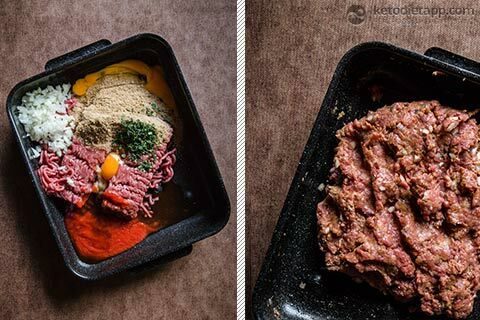 Place a sheet of silicone paper on your surface and tip the beef mix onto it. 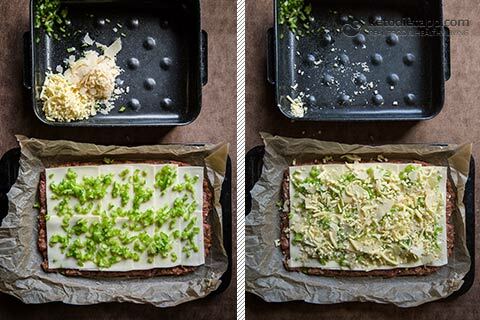 Using your fingertips, push and pat the mixture into a rectangular shape, making sure that it is no wider than your baking tray (do not make it too thin or it will break during baking). 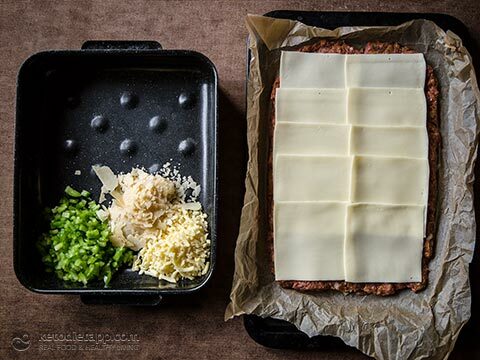 Once ready, place the slices of gouda over the beef, overlapping if required. Sprinkle with capsicum and finish with the parmesan and cheddar. 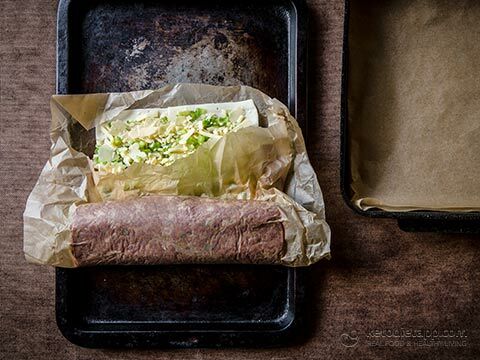 Starting on the short end of the rectangle, and using the paper to assist, start rolling the meatloaf up as tightly as you can. Make sure that you peel the paper back as you roll, so that it doesn’t get trapped in the roll. Pinch the ends closed as much as you can to avoid the cheese oozing out too much. 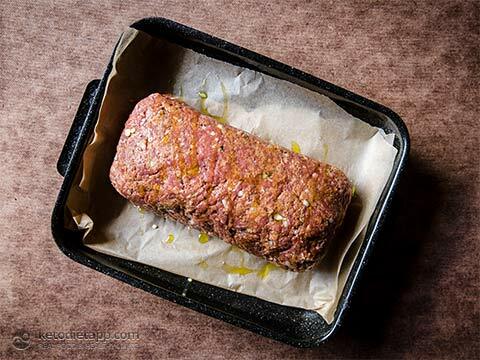 Place the meatloaf, seam side down, on your prepared baking tray and cover with foil. Bake for 15 minutes covered with foil. Remove the foil and bake for a further 15 minutes. Combine the baste ingredients in a small jug. Baste with the baste and cook for a further 30-45 minutes, depending on how large your roll is. Continue to baste as much as you like. Enjoy warm or let it cool down and store, wrapped in foil, in the refrigerator for up to 4 days or freeze. Tried this and it wasn’t a favorite. You can taste the flax meal quite a bit and it’s very mushy. Texture is a bit off as well. Unfortunately I doubled the recipe to save time and now I have an inedible meatloaf. I made this recipe with mushrooms instead of peppers and it was tasty, the texture was good, it was holding really well. On the other hand, you can taste the flax a little but it wasn't too overpowering. I wonder if it might be the flax meal. It can get rancid if you keep it at room temperature and then it smells kind of fishy (I ruined a batch of Keto Buns with it). It may not be the flax but thought it might help. If flax is not your thing, try almond flour (3/4 cup), grated Parmesan (3/4 cup) or coconut flour (1/3 cup). I hope this helps! Hi! I've got this beauty cooking in the oven right now! Can't wait to dig in! But ehm,, I've got cheddar left over that was in the list but not used in the recipe.. For future referance, when should've it gone in? With the Gouda, I guess? Hi Puppi, yes, it's together with gouda! I'll fix this, thank you! I think that will work well! I'd use mozzarella! I can’t wait to try this but I want to omit the flaxseed. 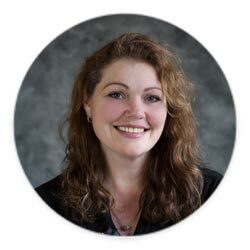 What substitute can I use? Anything stuffed with cheese is great to me! Looks delicious!